Pamulaparti Venkata Narasimha Rao is one of the great Prime Minsters we had. He was the first Prime Minister of India from South. Many people does not know that he was a very good Prime Minister, because, Congress never gave recognition to him. In 1991, P.V.Narasimha Rao retired from politics. Due to the death of Rajiv Gandhi, Congress became the single largest party in the parliament in 1991 General Elections. But, it did not have majority. Congress selected P.V.N.Rao as the Prime Minister, eventhough he did not contest in the General Elections. In his cabinet, he took two people who were not MPs (one was Manmohan Singh), and he himself was not an MP. To make him MP, Gangula Prathapa Reddy (MP of Nandyal) resigned to his MP position. Then, P.V.N.Rao contested from Nandyal. Because, he was the first Prime Minister of India from Andhra Pradesh, and then Leader of Telugu Desam (Chief Opposition Party) N.T.Rama Rao did not want to create any obstacle in his way, and did not put any contestant against him. By that, he won the election with a majority of more than 500,000, which is a world record. In 1990, India almost became bankrupt. The financial situation was worst. After he became the PM, he liberalized the Indian Economy. He brought the country to a stable state from almost bankrupt state. Eventhough credit goes to Manmohan singh, but, still his contribution is also very significant. At that time also, Sonia Gandhi tried to control him, but he carefully avoided her. He had kept complete authority over the loyalties of Gandhi family like Arjun Singh. Because of his authority over them, N.D.Tiwari, and G.K.Moopanar started their own parties, and Arjun Singh joined N.D.Tiwari. Because of his leadership and authority over everyone in the Cabinet, and Party, he could do whatever is good for the country. Whatever Manmohan Singh did as Finance Minister, he could not do the same as Prime Minister. Manmohan Singh was always controlled by people like Sonia Gandhi, and Arjun Singh. By that, one can clearly understand the leadership of P.V.Narasimha Rao. According to Vajpayee, when he became the PM in 1996 P.V.N.Rao handed him a piece of paper which simply stated 'Bomb is ready. You can go ahead.' (referring to a nuclear device) and asked that it should not be made public. Vajpayee revealed this only after the death of P.V.Narasimha Rao. L.K.Advani said in his book My Country My Life, "P.V.Narasimha Rao is the best Prime Minister after Lal Bahadur Sastry". L.K.Advani was the leader of Chief Opposition when P.V.N.Rao was Prime Minister. Still, he praised him, and wrote so many pages positively about P.V.N.Rao in his book. I am not aware of any other Chief Opposition leader, who praised the leader of the Government at that time. It shows the greatness of P.V.Narasimha Rao as well as the honesty of L.K.Advani. Unfortunately, Congress did not give any recognition to him even in Andhra Pradesh. Other than naming one highway in Hyderabad, there is nothing that it did for P.V.N.Rao. The publicity, importance, and recognition given by L.K.Advani, Abdul Kalam, and N.T.Rama Rao is much more than the same given by Congress when he was not in power (i.e., 1996 - till now). When most of the states naming their airports in the name of the great personalities of their state, the present Congress government removed N.T.R. 's name for the Domestic Airport. If Telugu Desam party comes to power again, they will try to undo whatever is done by Congress in the case of N.T.Rama Rao. Congress is not naming anything in the name of P.V.Narasimha Rao, and not allowing Telugu Desam Party to name anything in his name, by making them busy in undoing all the things that they did in the case of N.T.R. If Andhra Pradesh Congress does not give recognition to the first Prime Minister from AP, then who is going to tell about him to everyone and to future generation? Atleast 90% of the readers think that, this article is about songs sung by Dr.S.P.Bala Subrahmanyam in the movie Kathanayakudu. But, this is about Dubbing by Dr.S.P.Bala Subrahmanyam. Almost everyone knew that S.P.Balu was a monopoly in singing in Telugu industry. But, many people did not know that he is the number one dubbing artist. Other than Sai Kumar, I don't think a normal viewer knows any other dubbing artist. People know Sai Kumar, mainly because he became a hero after giving his voice to Suman and Rajasekhar. Other dubbing artists were not that much popular, mainly because Telugu Cinema industry does not give enough importance to them. In most of the big/popular movies dubbed from other languages, If the hero or the senior actor in that movie does not know telugu, then the voice was given by Balu except in the case of Rajinikanth. I think he used to give his voice to Rajinikanth in the beginning. But, for a long time, he was not giving. In Kathanayakudu movie, again S.P.Balu gave his voice to Rajinikanth. After seeing the movie, many people may give negative comments to his dubbing. It is because, if we are used to hear one kind of voice for a person, and if it is suddenly changed, then we will not like it. Same thing may happen for this movie as well. S.P.Balu became a dubbing artist with the movie Manmadha Leela, and after that he gave his voice to many people including Kamal Hasan, Rajinikanth, Mohanlal, Suman, Naresh, Nazar, Raghuvaran, Bhagyaraj, Girish Karnad, Gemini Ganesh, Nagesh, Karthik, Vinodkumar, and many more. He got the inaugural Andhra Nandi Award for the best dubbing artist for the movie Annamayya for his voice to Suman. Balu expected Award for his songs in Annamayya, but he got for his dubbing in this movie. (However, he got the best singer award for his song in Priya Ragalu in that year). Eventhough many people suggested him to do not tell dubbing, because he may lose his sweet voice. But, still balu continued with the dubbing since 1975 to many actors. He had two surgeries to his throat. Even then he did not stop dubbing, and he is still involved in all the fields that he is good at. Balu got Nandi Awards for best singer, music director, dubbing artist, and supporting actor, and his movie got Nandi Award for best movie. I am not aware of anyone in Telugu industry who got Nandi awards in five different fields. When I was a kid, adults used to bore me to tears with their crying out loud about how hard things were when they were growing up what, with walking twenty miles to school every morning... and just how difficult life was and how easy it was for us. But now that... I'm over the ripe old age of thirty, I can't help but look around and notice the youth of today. You've got it so easy! I mean, compared to my childhood, you live in a Utopia! and I hate to say it but you kids today you don't know how good you've got it! There was no email. We had to actually write somebody a letter...with a pen! Then you had to walk all the way across the street and put it in the mailbox and it would take like a week to get there! There were no MP3's or Napsters! You wanted to steal music, you had to hitchhike to the record store and shoplift it yourself! Or you had to wait around all day to tape it off the radio and the DJ would usually talk over the beginning and @#*% it all up! We didn't have fancy crap like Call Waiting! If you were on the phone and somebody else called they got a busy signal, that's it! and we didn't have fancy Caller ID Boxes either! When the phone rang, you had no frigging idea who it was! It could be your school, your mom, your boss, you just didn't know! You had to pick it up and take your chances! We didn't have any fancy Sony Playstation or Xbox video games with high-resolution life like 3D graphics! We had the Atari! With games like 'Space Invaders' and 'Asteroids' and the graphics sucked! Your guy was just a little square! You actually had to use your imagination! And there were no multiple levels or screens, it was just one screen forever! And you could never win. The game just kept getting harder and harder and faster and harder and faster until you died! When you went to the movie theater there no such thing as stadium seating! All the seats were the same height! If a tall guy or some old broad with a hat sat in front of you and you couldn't see, you just had it! Sure, we had cable television, but back then that was only like 7 channels and there was no onscreen menu and no remote control! You had to use a little book called a TV Guide to find out what was on! it was a pain when it came to channel surfing! You had to get off your a$$ and walk over to the TV to change the channel and there was no Cartoon Network either! You could only get cartoons on Sunday morning. Do you hear what I'm saying!?! We had to wait ALL WEEK for cartoons, you spoiled little brats! And we didn't have microwaves, if we wanted to heat something up we had to use the stove or go build a frigging fire.... imagine that! That's exactly what I'm talking about! You kids today have got it too easy.... You're spoiled! After a very long time, Chiranjeevi announced his entry to politics. For the last 10 months, he has been involved in politics in background like setting up his party, coming up with the contestants etc., he did not disclose it publicly, eventhough everyone knew that he is coming to politics. He disclosed it only on the last sunday. Even now also, he has not announced the party name, symbol or manifesto. He said that, he would announce the party name and symbol on 26th August. I am not sure whether he would announce the manifesto then or not. What he told is, he would give equal importance to all classes of people, and on the next day after announcing the party, he gave so much impression that, he is going to distribute all the positions in his party to all the castes. Within three days, Mahajana party (which is for development of BCs) merged with Chiranjeevi Party. Many people felt that, he is unnecessarily dragging everything. I agree that he is sincere and honest. But, he has not yet proven that he is talented and can really develop the state. He and his brothers always saying, social service, corruption and few other buzz words. But, he and his associates never said even one single thing about what is he going to do, or how is he going to do etc? They were doing many things which make people think that they are going to select the candidates based on the caste. If he is like this, then even if he uses the names of Abdul Kalam, still it is of no use. How can an educated person can vote for him, when he has not proven himself, not giving any information on what is he going to do, and going to use caste for selecting the candidates? N.T.Rama Rao (NTR) has created a record by securing the power within 9 months of forming the party. Chiranjeevi may want to break his record. By concentrating on the record, he may lose the opportunity to become CM. Even if he becomes CM, still, I will not consider the win better than NTR. Because, NTR formed the government within 9 months of establishing the party, and that 9 months include everything related to the formation of the party. However, in Chiranjeevi case, the total time he spent for the party is much more than 1.5 years. Chandrababu was one of the good Chief Ministers of Andhra Pradesh in the recent time. He single handedly developed Hyderabad and IT. He started many Engineering Colleges in Andhra Pradesh. He privatized many companies, closed the companies which cannot give any profits to the government. Eventhough opposition parties criticized him for closing/privatizing the companies, but he did in the best interest of the state. There were so many developments he had done in the state. On the negative side, he ignored the poor people. I am not talking about the subsidies he canceled or any other scheme that he canceled where government gives something to the poor people for free. Actually, that is not bad thing. It is very good for the state. In Engineering Colleges, AP used to have free seats and payment seats. The fee for free seat was Rs.5000 per annum, and for payment seat, the fee was Rs.35000 per annum. Those who get good rank in EAMCET gets free seat. If they get very big rank, then they have to opt for payment seat. It was a very good system. Those who are poor used to try for good rank, and get the free seat. The people who are rich and do not get good rank used to take payment seat. Chandrababu canceled this system, and changed the fee to Rs.22000 for everyone. Because of this, it became difficult for poor people to study. By the way, now the fees is Rs.35000 for everyone. When Y.S.RajaSekhara Reddy (YSR) became Chief Minister of Andhra Pradesh, I was happy that, he would take care of poor people. At that time, I wanted Chandrababu and YSR to become CMs alternatively, so that, Chandrababu takes care of development of the state, and the YSR takes care of poor people. I expected YSR to re-introduce free seats and payment seats. But, he did not introduce. Eventhough he introduced schemes like Arogyasri, it had very basic flaws. He did not do anything significant for poor people. If anyone starts a company, it will not give the results immediately. In the same way, whatever is done by Chandrababu gave results after few years. By that time, YSR became CM, and he is boasting himself that, because of him only everything got improved. Jayaprakash Narayana was an IAS officer, and a very sincere, honest, and talented leader. He is against reservations and corruption. He dedicated his life for good governance. He started Loksatta party last year. You can find the manifesto of loksatta at http://www.loksatta.org/agenda_god.php. After reading his manifesto, all the educated people will vote for him only. Loksatta is also on the same lines of Paritrana. I am going to Vote for Loksatta, and I would request everyone to vote for Loksatta for good government. Opposition parties are there to oppose. Period. It does not matter where the policy is good or bad. Their duty is to oppose whatever is proposed by the government. But, those rules can be broken in exceptional cases. What are the exceptional cases? If there is a proposal which can collapse the country, economy or development, then all the parties unanimously agree to that proposal, and they will collapse the country/economy/development. Reservations is one good example. When Arjun Singh introduced reservations for OBCs, except a couple of BJP MPs, nobody opposed it. Many regional opposition party leaders appreciated Arjun Singh publicly for that. If we have those kind of people ruling our country, it is very difficult to see Secular India where everybody is equal. There were 750 Nobel prizes were given out between 1901 and 2007. 162 Nobel Prize winners were jews, and they comprise more than 20% of all the winners. But, Jews population comprise only 0.2% of the world population. If Jews were born only in India, then what would have happened? These politicians would have brought a new system, where there will not be any Open category, and each caste/religion will get the corresponding quota depending on their population. So, Jews get 0.2% reservations in everything, and they have to compete in that 0.2% quota only. I am not sarcastic in saying this. I am very optimistic that it could have happened based on my readings about politicians in the last 20 years. Till 1989, the total reservations quota was around 22.5%. But, now, it is much more than 66%. In the last 20 years, the politicians increased the reservations by 2.5 times. I am sure Ambedkar did not expect this. People like V.P.Singh, Arjun Singh, and Y.S.Rajasekhar Reddy introduce more and more reservations. But, unfortunately there is nobody who can reduce/abolish the reservations. Because, if anybody reduces or cancels the reservations, then they fear that there will be so many riots in the country/state, and they will lose the votes of the people from that community. Because of that, reservations are increasing, and there is no chance of decreasing. However there are few good politicians who are against reservations. When V.P.Singh introduced reservations for OBCs, Rajiv Gandhi was the first person to oppose that. On 6th September 2000, Rajiv Gandhi gave one of the longest speeches in the parliament for more than two and half hours against reservations. In Mid 90's, Kanshi Ram publicly said that it was time to cancel all the reservations. But, the successors of Kanshi Ram act against his principles and they use his name for that. Eventhough L.K.Advani do not like reservations, he cannot say that publicly, because of several reasons. When he was Home Minister, he took everyone in his ministry only on the merit basis. Jaya Prakash Narayana was an IAS officer, founder of Lok Satta and a great leader of Andhra Pradesh. He is completely against reservations. In his manifesto for the next elections, he came up with a new plan. In that, instead of the reservations, 10% of marks would be added to SC/STs. It is a very good idea, when we cannot abolish all the reservations. With this approach, SC/STs who get 35% marks will not compete with the people who get 50% marks. However, now they are competing with people who get more than 80% marks. Whom should I blame for this? The three people who were next to me? The entire group who got down at the next stage? I would blame the common voter for this. The major political parties think that, it is a crime to privatize or allow private services in any field. Government cannot develop any of the government companies or the services, and it does not allow private people to do that. But, the common voter votes for only the political parties which takes the state in reverse direction. In this specific case, I have two options. Either pay Rs.5, and take the city bus, and potentially lose Rs.9000, or pay Rs.100, and take an auto, and do not lose anything. There is nothing between Rs.5 and Rs.100. Either I have to pay very less or very high. I expect some thing in between. I would like to pay Rs.20 or so, and travel by a bus and do not lose anything. Unfortunately, due to government policies, this is not possible, and many people like me are suffering. If common voter votes for a sincere, honest, and talented person, he/she would have improved the transportation, and then there will be very less no.of thefts in city bus service. This is how we should find the root problem and solve it. The root problem of theft in a city bus is, not voting for a sincere, honest, and talented person. I would be very happy, if everyone casts their vote for a person who can take the country/state forward. In slashdot, an anonymous asked one question. He/she was asked to file a patent by his/her manager, and he/she does not like to patent that stuff. What is the best way to avoid this and at the same time, not losing his/her job. It got very interesting comments from the readers. Just patent the process of firing someone for refusing to file a patent. Then they'll have to license the technology to be able to use it against you. "So, on this flux capacitor patent thing: What do you guys make of this Heisenberg compensator design I found at this URL here? I kind of derived my design from that, is that something that would go in the prior art list we talked about during the IP attorney meeting the other day?" If the invention is obvious, Make an anonymous posting somewhere (written by your friend), describing the innovation you came up with. If it has been disseminated before, it cannot be patented. This is a fairly common process with companies that either cannot afford to patent or don't want to. They put in a 1 page ad in some random magazine (Sheep Shearer Magazine, New Zealand) describing the invention and order a copy of the magazine. Then when someone else comes along and threatens a lawsuit because they patented the process, they simply show the magazine again and Bob's your uncle. Most of the political parties in India are there to oppose all other non-alliance political parties. It does not matter whether the policy is good or bad. Their duty is to oppose whatever is proposed by the other political parties. When Telugu Desam Party (TDP) was in power, it tried to privatize bus service, and Congress opposed it, and TDP could not do it. After that, Congress came to power, and it tried to bring private buses. This time TDP opposed it, and Congress could not do it. As a regular passenger, I don't care who brings it. I just want more buses in the state. But, those political parties will not do what is good for the country/State. Their intention is to oppose the government, and they oppose it. In 1998, Vajpayee performed Nuclear Tests within two months of taking the power. At that time, entire India praised Vajpayee for that except Congress (including Sonia Gandhi, and Manmohan Singh). Congress felt that, India would lose the support from US and other countries because of that. However people like Sharad Pawar praised Vajpayee publicly (and then later on moved out of Congress for different reasons). After Congress came to power, Pranab Mukherjee criticized BJP and L.K.Advani that it is not possible to do research and develop the entire infrastructure for Nuclear Tests within two months, and they should understand that it is not their (BJP's) victory. Pranab Mukherjee talked as if, Congress government should get the credit for Nuclear Tests. It is completely contradictory to what they said, when they were in the opposition. L.K.Advani clearly and publicly mentioned the history of the Nuclear Tests. He said that the entire development for Nuclear Tests had been completed by 1983. But, still no Prime Minister had dare to do the Nuclear Tests, and Vajpayee did it. Where did BJP take credit of Indira Gandhi's contribution? There are many instances like this in almost all the political parties except two or three. If they are in opposition they talk in one way, and if they are in power, they talk in different way. Till 1970, there used to be private bills in Parliament. This generation may not be even aware of what is a private bill, because there was no private bill passed after 1970. A private bill is similar to a normal bill, but, it would be proposed by any MP of any party. Based on the discussion and voting on that bill, Parliament will accept/reject that bill. The party which is in power will have majority, and without their acceptance, nothing will be passed. So, what is the use of these private bills? Suppose, if the bill is controversial, or for some reason the party which is in power does not want to take credit for that, then they would use these private bills. Some opposition party or even an independent will introduce the bill, and after discussion, they would pass the bill. With that, the party in power does not get credit (even if some of their party members vote for the bill), and still they will do what is good for the country. But, now-a-days, it is not possible to see that kind of bills at all, because of the attitude of the politicians and political parties. Except two private bills all others were passed in the tenure of Jawaharlal Nehru, and Lal Bahadur Sastry only. Those two private bills were passed in the tenure of Indira Gandhi, one in 1969 and the last one in 1970. After 1970, there was no private bill passed in Parliament. All the political parties oppose other parties, because, if they don't oppose, then they would lose votes. If a political party always supports another political party, then it would lose it's identity, and everybody votes for the other political party. So, it has to oppose other parties. The final loser is the common man. I believe in astrology, but not astrologers. Many people consider astrology is wrong. It is just guessing and not correct. I understand their situation. Only if they see a good astrologer and get correct predictions from them, then only they will understand about astrology. Till then, they will not believe astrology. Except my close relatives, almost nobody knew my birthday including my close friends and colleagues. If anybody asks my birthday, I simply reject and don't tell my birthday. Whenever I register in any website, and if I have to enter my birthday, I always enter one random date and not my birthday. My official birthday is different from my actual birthday. So, even if someone gets my certificates, license, or passport, still they cannot find my actual birthday. So, technically it is not possible to find out my birthday without asking any one of my relatives. Few days back, I started chatting with one of my blog readers, Aakanksha. I did not know her before, and I started chatting with her regarding many things in my blog, and many spiritual topics. She asked my birthday and as usual I did not tell. She asked me atleast the sum of all the digits in my birthdate. I told her that, if I tell that, she will have less no.of dates, and she would be knowing my birthday with probability much more than 1/366. I don't want anybody to know my birthday with probability more than 1/366. Then, she gave me 3-4 dates for my birthday, and it is absolutely correct. She found my birthday with probability 0.25 to 0.33, which is much more than 1/366. She is a good astrologer. She gave explanation on how she found those dates. After chatting with me for 3 days, she understood me very well. Based on that, she matched my qualities with the qualities of people of different sun signs. Similarly she matched my qualities with different groups based on numerology. she found my sun sign, and my number (sum of digits in my birth date). From sun sign, she got the probable months, and from the number, she got the probable dates, and intersected those, and she told me the 3-4 dates. (I am saying 3-4 dates and not exactly how many dates she had given me, because, I don't want to give any hint to the reader to increase the probability more than 1/366). She says it is very easy. She just needs to know about the person, and match with the qualities of the corresponding sun sign and the number. It may be easy for her, but, I never saw/heard in recent times who can tell the possible birthdays just by talking to that person. Around a few years back, I met an astrologer Siva Sankar Rao Adigopula. He told me three predictions. He gave me one date and one incident, and that incident happened on that date. By guess work, one may predict the incident, but, not date. When he gave the second prediction, I was sure that there is not even 10% of chance to happen that incident. But, it happened in the same year which he predicted. For the third prediction, the chances were 50-50, and whatever he predicted happened. After interacting with them, I started getting more respect for astrology. At the same time, I am not going to any astrologer for any prediction unless he or she convinces me with very good unbelievable predictions, or tell about past things that nobody knew. By the way, my brother Rajesh Tiruveedula and the astrologer Siva Sankar Rao Adigopula developed one software for astrology. It can be downloaded from http://www.mangalagiri.org/astrology.html. My faith in god has been like a typical up and down graph. Sometimes my belief in god is very strong while at other times, I don't think god exists. Well there has got to be some sort of power that is just there, if everything had a scientific answer, there wouldn't be anything like miracles. Miracles do happen - sometimes things go beyond logic and rationale. I have experienced a few myself. Somewhere deep inside me I know there is some sort of a supernatural power but its just for me to conceptualize it. So I have devised a strategy. Math majors would know about this. When I was in grade 9, we learned how to solve differential equations. A differential equation is solved by starting with the solution itself. Sounds weird, doesn't it? It sounded very weird to me, especially when I hated math so much, but that's the way it was. To solve a differential equation, you need its solution right at the first step - so whether or not you want to know the solution then, you need it so as to solve it. My belief in god seems analogous to the solving process of this differential equation. I need to believe or stick it in my head that there is a god (the solution) and only then I could go about finding answers to my questions of life (differential equation). So with the solution in mind (belief in god) I can start about solving (path of spirituality) the differential equation of my life. I have travelled across the length and breadth of India and I have not seen one person who is a beggar, who is a thief. 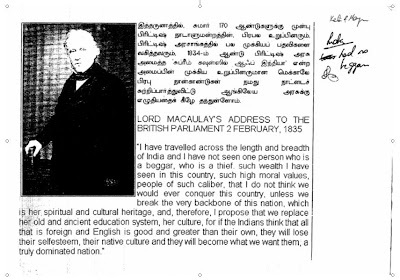 Such wealth I have seen in this country, such high moral values, people of such caliber, that I do not think we would ever conquer this country, unless we break the very backbone of this nation, which is her spiritual and cultural heritage, and therefore, I propose that we replace her old and ancient education system, her culture, for if the Indians think that all that is foreign and English is good and greater than their own, they will lose their self-esteem, their native culture and they will become what we want them, a truly dominated nation. This is not true. Refer http://satyameva-jayate.org/2007/06/26/clearing-the-dust-off-macaulays-quote/. Thanks to Jude for pointing this. A true friend is one with whom we can talk whatever is there in our mind, without worrying about whether the matter is confidential, controversial, rumour, fact, or just a thought, and even if it is not in constructive form, or criticizing some one. With a true friend, we can talk and think. Where as with everyone else, we have to think and talk. In my company, we have to change password every two months. The new password cannot be similar to any of the previous 24 passwords. i.e., It will not allow, if you just change one character in the previous password. It should contain uppercase letters, lowercase letters, digits, and special characters. I can remember one very big password which has more than 30 characters with digits, lowercase/uppercase letters, special characters. I can make sure that, nobody sees the password while typing. I can also make sure that, I will not type this password except in office on my computer, and not anywhere else. But, that does not satisfy the security team in my company. But, I don't have that much memory power to remember a new password every two months. So, what do I do? Write down the password some where. Rule is followed, but the spirit is violated. If anybody wants to criticize democracy, the first example that they give is defeat of Dr.Manmohan Singh in 1999. I would like to give my analysis on that. Manmohan Singh participated in direct elections only once. That was in 1999 from South Delhi. He lost to Vijay Kumar Malhotra (BJP). To understand, why Manmohan Singh lost that election, we have to analyze few things. Vajpayee became Prime Minister in 1998, and since he became PM, he started facing problems with Jayalalitha. After 13 months, Jayalalitha withdrew the support, and Vajpayee lost the vote of confidence by single vote. Even then also, the lost was unfair. I am not counting Saifuddin Soz, who voted against Vajpayee, by declining his party's whip. These days, many MPs are not following their parties whip. The unfair vote was from Orissa Chief Minister. Orissa CM Giridhar Gamang (Congress) did not resign from Loksabha eventhough he had been in CM position for few months. He voted against Vajpayee government. Had he not voted in that, both sides would have got equal votes, and Speaker would have supported the government (Because speaker was from TDP, which was supporting Vajpayee government). But, because of this invalid vote, he lost it. In that 13 months, Vajpayee has done many good things including Nuclear Tests. He was not given full chance to serve the country. Now, the elections are held because of that one vote, and thanks to Jayalalitha, Congress, and Giridhar Gamang. As a voter, whom should we vote? BJP's PM candidate was Vajpayee, and he is trying to do good service to India. The only other alternative was Congress, and it did not declare it's PM Candidate. There was also sympathy that, he lost the vote of confidence by unfair method. 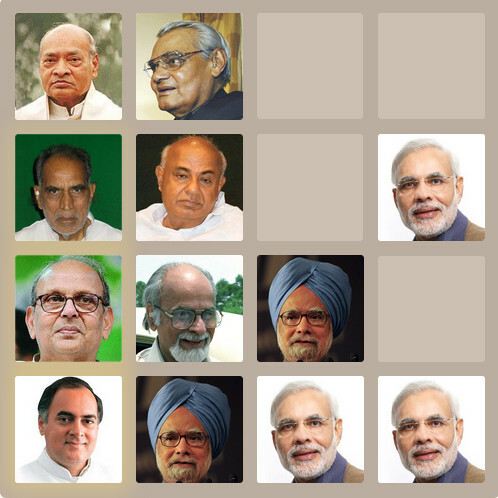 If somebody wants to see the Vajpayee as the PM, they have to defeat Manmohan Singh. If they want Manmohan Singh as the MP, then Vajpayee may get less majority, and may not become PM. If people in South Delhi wanted to see Vajpayee as the PM, then there is no other option other than defeating Manmohan Singh. BJP was formed in 1980, and it's first participation in Loksabha was in 1984. In 1984, due to the assassination of Indira Gandhi, Congress had won in 411 seats. Because of the sympathy, all other parties lost badly at all places. BJP won only two seats in the entire country. As expected, it lost in South Delhi as well, and the contestant was Vijay Kumar Malhotra only. After that, Madan Lal Khurana (Ex-CM of Delhi) revived the party, and he worked tirelessly for Delhi. For his contribution, he got the title 'Dilli Ka Sher' (Lion of Delhi). Because of his efforts in Delhi, BJP never lost in South Delhi after 1984, and It became like a fort for BJP. From 1989 to 1998, there were four Loksabha elections, and one time BJP got a majority of 12%, and all other times, it got more than 20%. 20% majority is not a small majority. Nobody who wants to become an MP will contest from South Delhi from some other party. All politicians knew this. If a party is consistently winning from a place with a very good majority, they will put a good candidate, but they will not put someone who must become an MP. i.e., No Prime Minister Candidate will contest from Constituency like South Delhi from some other party. Manmohan Singh was asked to contest from South Delhi. What does it mean? I clearly understand that, Congress is not desperate to make him as an MP. But, they want to put some good candidate in South Delhi. So, they had chosen Manmohan Singh. If he had contested from a place where Congress is strong, or atleast other parties are not very strong, he would have won. But, Congress had chosen BJP's fort deliberately, and that's why Manmohan Singh lost. Even then Manmohan Singh lost by only 6%, which is much better than previous Congress contestants. Computer Science and Electrical/Electronics - Which one is better? Many students are opting for Electrical/Electronics over Computer Science. One reason for this is they think that, to become a Software Engineer, they need to know C++, Java, and .NET. They can learn those while studying Electrical/Electronics. So, they are opting for Electrical/Electronics over Computer Science. More than 90% of the students in normal colleges have this perception, and because of that they are choosing other branches. However, this perception is not correct. One reason for this is the low standards of education in normal Engineering Colleges. Not only the lecturers of normal colleges, even many software engineers could not give satisfactory explanation on why that perception is not correct. That's why many people are choosing Electrical/Electronics. For example, How many software engineers felt that while writing Connection.setTransactionIsolation() requires understanding of all the Isolation levels like Read Committed, Repeatable Read, and Serializability? Unless they have the clear understanding of all these, they cannot choose the correct isolation level. They are core DBMS concepts, and are not taught in any institute which teaches Oracle, SQL Server etc. There are many concepts like this in Computer Science, which require while developing any reasonably big application. In many colleges, they just teach the concepts, and not how it is used while writing code. It is very difficult to remember a concept for few years without understanding it's use. If the lecturers accompany the practical example for each concept, then the students will understand it better, and we get better software engineers.